A native of Hingham, Massachusetts, Alexander studied to become an aviation engineer in Boston , but in the early 1960s he began to get involved in racing, preparing 500cc racing engines for a friend. 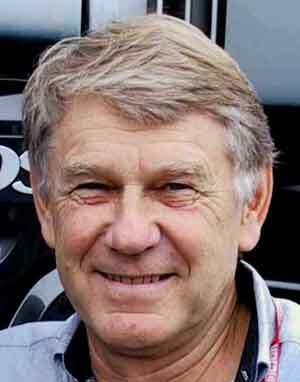 This introduced him to the world of motor racing and in 1962 he became a mechanic with Texan oil millionaire John Mecom's sportscar team. Through racing he got to know Philadelphia lawyer Teddy Mayer, who was running Rev-Em Racing in Formula Junior for his brother Timmy Mayer and a college friend from Cornell University, Peter Revson.In 1963 the Mayers and Revson went to Europe to take part in Formula Junior races and took Alexander with them. Teddy Mayer helped Bruce McLaren to establish his racing team at the end of that year and Alexander became a mechanic with Bruce McLaren Motor Racing Ltd.It was the start of a relationship which would see him become first chief mechanic, then chief engineer and ultimately a director of the company. Initially involved in F1, Alexander became increasingly part of the McLaren empire in the United States, overseeing it from its base in Livonia, Michigan. McLaren's early success came in CanAm racing where the company won five successive titles (1967-71) and a record 43 victories for McLaren, Denny Hulme and Revson. The team then turned its attention to USAC racing and with drivers such as Johnny Rutherford and Tom Sneva won two Indy 500s in 1974 and 1976 and one USAC title.In 1979 Alexander was called back to Europe by Teddy Mayer to help make the McLaren F1 team more competitive and worked as engineering director. In September 1980 Team McLaren merged with Ron Dennis's Project 4, at the instigation of their shared sponsor Marlboro. Alexander had a small shareholding in the new McLaren International, but at the end of 1982 he sold this to Dennis and departed the company.He and Mayer formed a British-based Indycar team called Mayer Motor Racing for which Alexander ran the technical operations. The team came close to winning the 1984 Indycar title at its first attempt, with driver Tom Sneva. Mayer Motor Racing disappeared soon afterwards when Mayer and Alexander became the team principals in what was to become Carl Haas's Beatrice F1 team. Alexander was team manager of the operation, but when Beatrice unexpectedly pulled out the team was forced to fold. Alexander went on to run the BMW IMSA sportscar team before being hired by Ron Dennis of McLaren as Special Project Manager. He remains with the team today.An accomplished photographer, Alexander has had his pictures from F1 in the 1960s published and exhibited around the world.